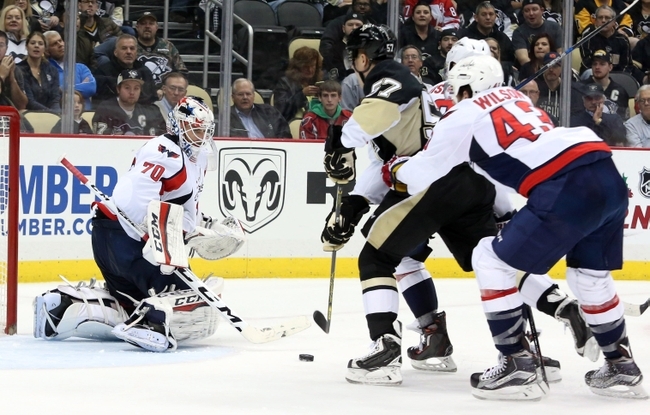 Generally, the rivalry between the Washington Capitals and Pittsburgh Penguins has more than enough emotion and storylines to go around. On Monday in Pittsburgh the drama was eve up a notch as the Penguins hoped to welcome new head coach Mike Sullivan to the Steel City with a win over one of their biggest rivals. Instead, the Capitals scored the first two goals in the first period, and added another in the third for good measure and Braden Holtby made 44 saves in a 4-1 triumph to finish their three-game road trip in style. T.J. Oshie helped start the affairs less than four minutes into the game, as he flew down the right wing before stopping in a hook pattern and feeding a trailing Nicklas Backstrom. Backstrom quickly rifled one past Marc-Andre Fleury for his 10th of the season. John Carlson scored off of his own rebound barely three minutes later to double the Washington lead. Evgeni Malkin deflected Ben Lovejoy’s slapshot from above the right circle later in the frame to make it 2-1, but Oshie’s ninth goal of the year in the third was arguably his prettiest, and he added one more for good measure with 48 seconds left. The Caps have taken points from 13 of their last 15 games, are 21-6-2, and are three points ahead of the Islanders in the Metropolitan Division with two games in hand. Braden Holtby came up huge again. Stopping 44 of 45 shots (37 of 38 at even strength), Holtby saw the puck exceedingly well as a lot of the Penguins’ shots came from the slot or higher. The Caps can withstand energy from the opposition. Pittsburgh came out with guns blazing from the opening faceoff, especially on the opening shift. Washington didn’t waver, and though they were outshot 45-34, it was a strong performance all-around.